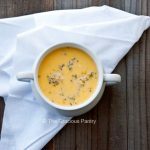 This clean eating broccoli cheddar soup is full of brothy deliciousness! Oh ya, this is the good stuff. I mean, cheddar and broccoli are such a wonderful, comforting combination anyway. But turn that into soup and you’ve got a wonderful meal for a cold winter night! Serve it with some crusty, just-out-of-the-oven garlic bread and relax into your evening meal. It’s creamy, brothy savory, and just the right balance of cheese and green veg. I try not to make this too often, but it’s hard not to want this every night when it’s chilly out! This is also great for a busy weeknight too. It cooks up pretty quickly (10-15 minutes!). The ingredients are basic, you probably have most of them on hand already, and if not, a quick trip to any grocery store will quickly get you what you need. Just make sure you have your comfy jammies and your fuzzy slippers on to enjoy the full effect! This is not a really thick soup. It's meant to be more on the brothy side (compared to the regular stuff). Also, to make this work, you need the fat content. So don't use low fat cheese or milk, and keep your heat low. In a medium soup pot, warm the cream or milk and chicken broth over low to medium low heat. Once warm, stir in the cheese, a little at a time making sure that it melts before you stir in more. Stir constantly to avoid the cheese burning on the bottom of the pot. Add in the garlic and onion powder as well as the broccoli and cook until the broccoli is just tender, stirring continuously for about 10 minutes. Add salt to taste if needed and serve. I made this yesterday and the cheese wouldn’t melt! It was a thick clump on the bottom and wouldn’t melt. It tasted good, but what did I do wrong? Jennifer – It either didn’t melt completely, or it didn’t get cooked long enough to melt fully. Was the heat on low? You can’t do this over high heat. Mine clumped too and I cooked it over low for longer than the recipe said. Julie – Hmmm. What kind of cheese did you use? My cheese did not clump on the bottom of the pan, but it did make a bunch of little clumps on the broccoli. I heated the milk and broth over Low-Med heat until the outside perimeter started to bubble, then slowly added my cheese. I shredded a block of extra sharp cheddar from Trader Joe’s and kept the pot on the same temperature. My soup was rather thin, though, so I let is sit on the stovetop for about 5-10 minutes so it would firm up. Didn’t work…but I think it was because the cheese was micro-clumped around the broccoli and didn’t make a “cheese sauce” for the soup. The flavor was nice but the texture wasn’t typical of cheddar broccoli soup. Not sure what happened! Oh and I used milk instead of cream…that may have something to do with it too. Dana – This isn’t a terribly thick soup. It is a touch more brothy, so you probably got pretty close. 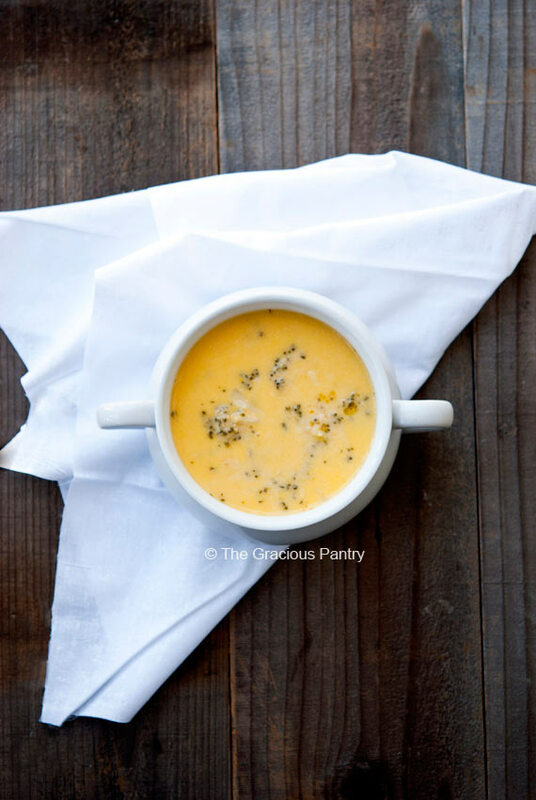 Cheddar broccoli soup is dependent on the fat, so you most likely do need the cream. I will adjust the recipe to reflect that. Thanks for the feedback! I know this is an older recipe but I’ve been on the lookout for a good Cheddar Broccoli because it’s a favourite of my daughter. I am curious though about the cream used. When purchasing “real cream” there are still various fat percentages. There is 5% and 10% available in our stores but I’m not sure if they actually count as cream even though marked that way. Depending on where you look there are different opinions. Then there is 18% and of course whipping cream at 30% and heavy cream at 36%. When you state real cream are you using the 18% cream? I did and it worked out well, but if you are using a lower fat percentage and having good results then I would like to try that. Lovely soup overall. She liked the flavour a lot so even though it wasn’t as thick as she’s used to she enjoyed it. BTW I had no issue with the cheese melting but I followed the directions exactly and I knew from cheese sauces and such that it has to be a gradual add with constant stirring. I made this using the heavy cream and with 2 cups of cheese, following the instructions and it was thick and tasted wonderful. Thanks for sharing.